Looking for a couple of cuties? ​Mowgli is the all black male and Samara is his sweet faced sister. Mowgli is a huge cuddler, while Samara is more adventurous. Both are sweet and playful. Samara's coat has the ticking like an abyssinian. They are currently being housed at Whiskers to Tails, and you may call for a meet & greet, 626-795-4134. Come and adopt both to get our "Twofur" discount! They will come spayed/neutered, current on vaccines, and microchipped. Click a picture to enlarge & see all. Both youngsters are adorable, and will make any home very entertaining! Meet spunky "Zsa Zsa." She's friendly, playful, healthy, and good with other cats. We would also see no problem with dogs, if introduced as advised. Zsa Zsa has the cutest little "smudge" on one side of her nose! This little darling's owner went into assisted living, and Zsa Zsa is now residing at Whiskers to Tails Cat Hospital. Please call them to make an appointment to meet Zsa Zsa, 626-795-4134. TUCKER BABY we call him!!!!! This is one fun loving little dude who would do well in an active home. Loves to play, loves every single cat in our rescue, loves all of us! He has simply blossomed from when he used to be extremely shy. When we first rescued him, he hid constantly, and once we put him in with our other kittens, he learned the life of play, love and affection. Tucker is currently in a foster home to help him with his confidence. We have learned that he is still very shy when in a new environment and will take an extra amount of time to have the courage to mingle with others. Please adopt our super soft furred, handsome Tabby Boy, and give him the great home he deserves. He will provide you with endless entertainment and follow you everywhere you go. 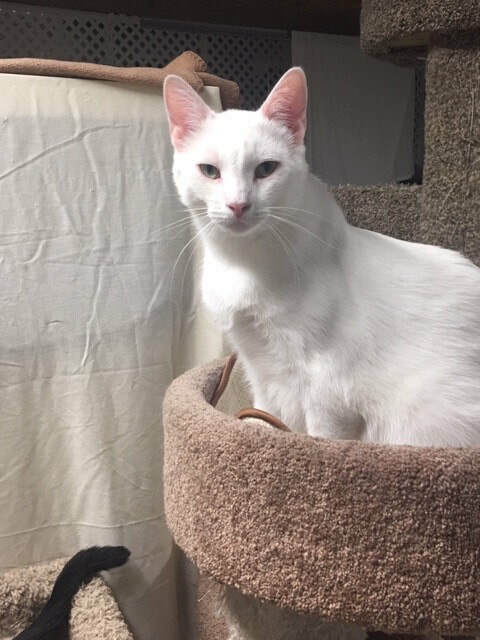 Tucker would love to be adopted with one of our other nice kitties, or maybe you have a resident cat who would like a lively playmate. Pounce your mouse on any picture to enlarge the pics and see the slideshow. Molly is young, curious, and playful. She is very friendly, too, as long as she can rule the roost. She is lovey-dovey on her terms, but will always welcome head and neck scratches from you! Molly would prefer being an only kitty, and would do best in an adult only home. Now let's get this deserving girl a forever home, where she can really blossom, run your house, and be pam-purr-ed! Please call the number above & on the pictures to arrange for a Meet & Greet. Two's Company! Do you love white cats? Then here's a beautiful pair for you: HOPPER & LADY BUG, age 1.5. The male is Hopper, and his twin sister is Lady Bug. 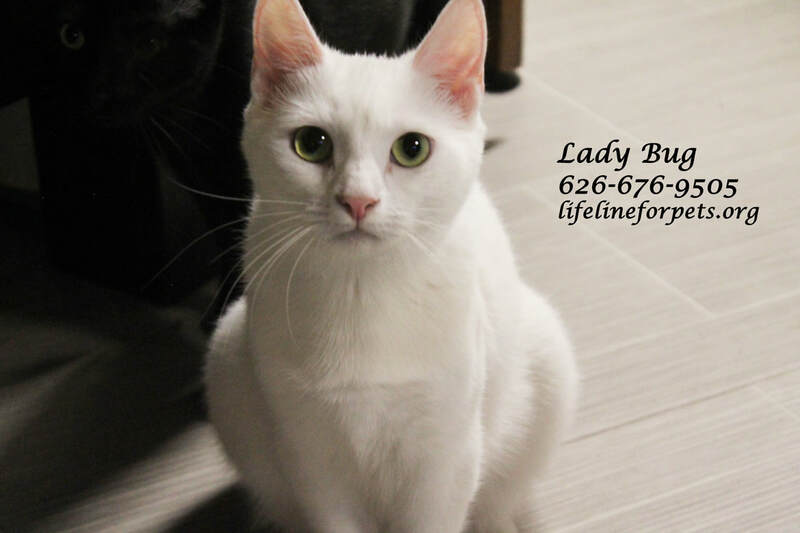 Lady Bug is so sweet & delicate, rather shy and doesn't like to be held, but she does like to play. 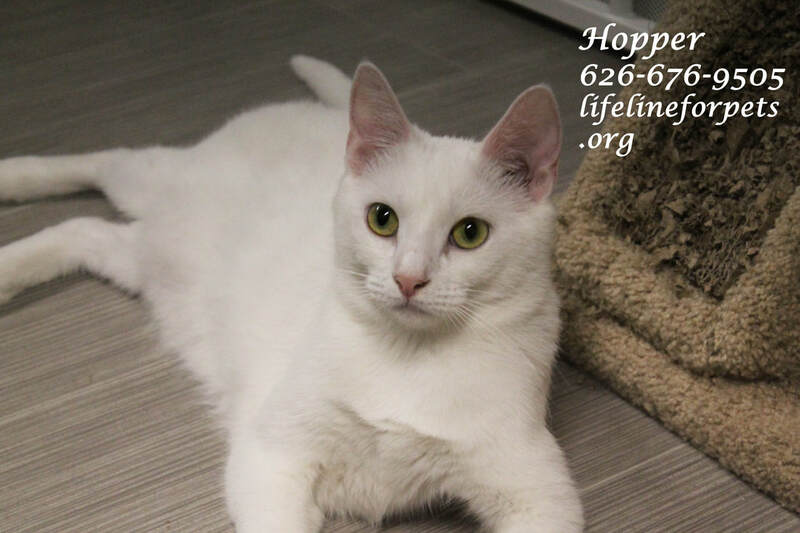 Sweet Hopper is just simply a loving playful boy, who often likes to give you lick kisses. Come and adopt one or both! Remember--white goes with everything! They will come spayed/neutered, current on vaccines, and microchipped. Use our Twofur Offer for savings! Pounce your mouse on any picture to enlarge the pic and see the slideshow. See their VIDEOS . . . These boys are soooo handsome! Leo, especially, sports very bold markings, while his brother, Micah, wears white paws. Still quite shy, but perhaps on the brink of becoming more confident. Both are polydactyls, which means they have an extra toe. Call the number above to arrange a meet & greet. Come and adopt both to get our "Twofur" discount! They will come neutered, current on vaccines, and microchipped. A quiet, patient home may be best. Click on any picture to enlarge & see names.